.............when possible, to stay in touch. But somehow life seems so busy always. I have a long list of things to do, things to fix, people to call, places to go, books to open, projects to start-finish-complete, slam the book shut on..........but it doesn't seem to happen. Meanwhile I feel that my busy, full life, although wonderful, may be passing me by. Am I missing the small sweet things? Little snippets of daily life which allow a pause, a break, a quietness, some silence, peace of mind, stare into space, put up my feet, sip an iced drink through a slow straw, see pictures in clouds, or nothingness for a short while. 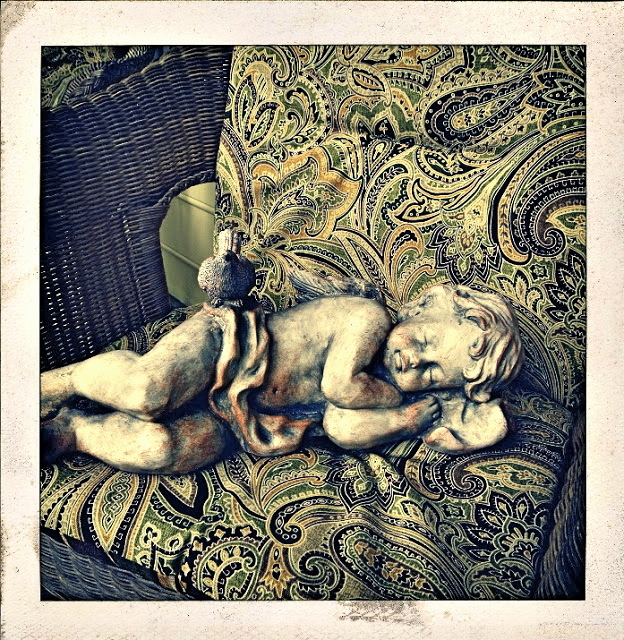 My sleeping front porch cherub. Remember when we were children, how Summer seemed so long, so full of endless sunshiny days, no agendas, no rules, no deadlines - in fact when I was a child I doubt 'deadline' was even a word. I thought today would be a day like those eons ago, where I could rise without an alarm clock jolting me from a sound sleep. A day I could own. I planned to spend a little early morning time pruning the jasmine - it bolted again with the rains and is encroaching on the front entry to the cottage. It just didn't start off right. Last night's torrential rain and house-shaking thunder brought a dreary, damp morning. Soon it was humid and mosquitoes were swarming from the damp leaves. Instead I made the usual big pot of coffee even though Bob's away, and sipped until almost lunchtime. In between I did laundry, ironed, pulled out clothes for the upcoming trip, chose a few pieces of jewelry to take, looked in horror at the piles of toiletries and cosmetics I don't need to take for a little Summer vacation. I sent a few e-mails, I worked on a blog post about Kamchatka in Russia. I made healthy, green spinach and zucchini soup for when Bob comes home tomorrow. I thought about family members who have drifted away and how I miss them. I had my neighbors (three generations - a grandma, daughter and granddaughter) over for wine, cheese and a chat this evening. I thought about the lovely day I spent yesterday with my granddaughter at the mall...............and recalled how I seemed to be the only female there not wearing short shorts which made me realize I am old. Yes, I am (getting) old. A good friend celebrated a birthday today, she is older than me. Most of my long time friends are as old or a little older than me. My few much younger friends - bless them for wanting me around - are marvelous women. I watch them, I listen to them, I see their energy, their lightness, their hopes and dreams for the future.....it enthralls me and makes me want to be young again, even a bit younger would do. I love their company and am happy when with them. They make me 'feel young', whatever that means. And now this day is almost over. Did I waste it, not really I suppose. Was it perfect, no, but it was pleasant and it brought me to this late evening feeling grateful for the hours I had. This week I was able to cut the bunch of lavender shown above from my garden. I left about the same amount growing because the bees were also enjoying it so much, and we do need our bees for pollination. 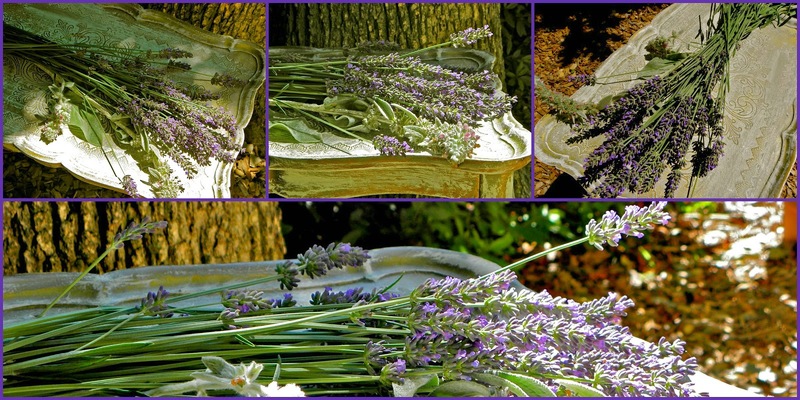 I love, love lavender for its wonderful fragrance, its color, and for all the many uses for perfuming our surroundings. 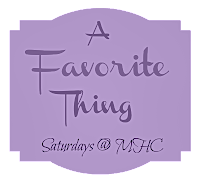 Fragrance for the body in soaps and lotions, linen water to spray as we iron, or on the pillow to help sleep on those nights when we toss and turn, In cooking, especially baking, it can add a flavor like no other......and then there's always lavender honey! Here are some of the lavender photos I've taken over the past few years - funnily I can recall each particular place when and where I spied the lavender............always beautiful, always fragrant. Some of these pics of lavender products were taken close to home at the Sunshine Lavender Farm here in North Carolina. My lavender plants were purchased from there three years ago and are doing well. Go here to visit Annie's beautiful place and learn more about planting and growing your own lavender. My very own French lavender - love it! we all get busy with Independence Day plans. My living room is small and comfy. The wall of windows faces north so the area is somewhat dark, especially on cloudy days, with no direct sun shining in. Many old stately trees in my garden, and in the property directly behind, also create shade at the back of the house. I've added several mirrors in this room, even the coffee table has a vintage foxed mirror top. 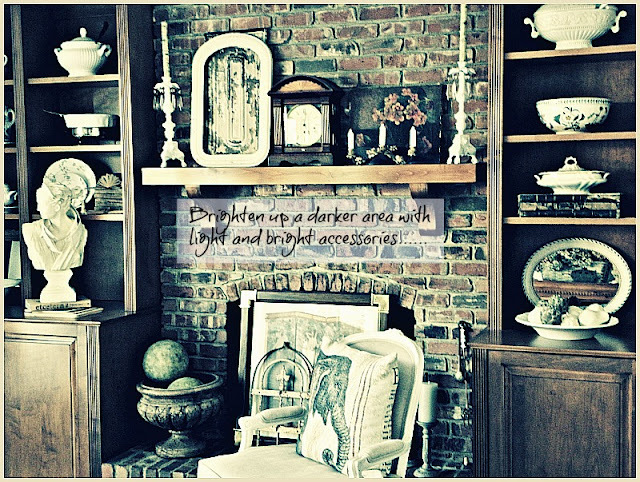 Mirrors can work wonders in a darkish room, as can subtle lighting.....and don't we all love to burn candles in the evenings. 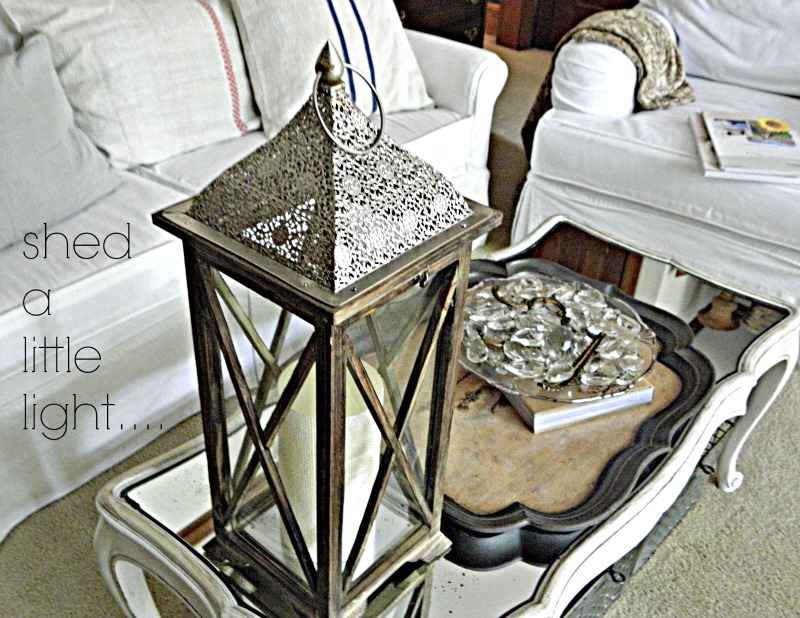 I love this wooden lantern with the filigreed 'silver' top - found last week at Homegoods. I'd been looking for a really large one but the prices were high in places such as Pottery Barn. This one was a steal at just $24.99, and I already had the tall linen wrapped candle. I was actually quite bowled over at Homegoods....haven't stopped in for some time and was amazed at how much better the store looked, and the offerings, especially in the china department, were awesome. No, I refrained from purchasing more dishes.........but admit it was hard to pass up those pretty Summer inspired plates with coral, starfish and shells. 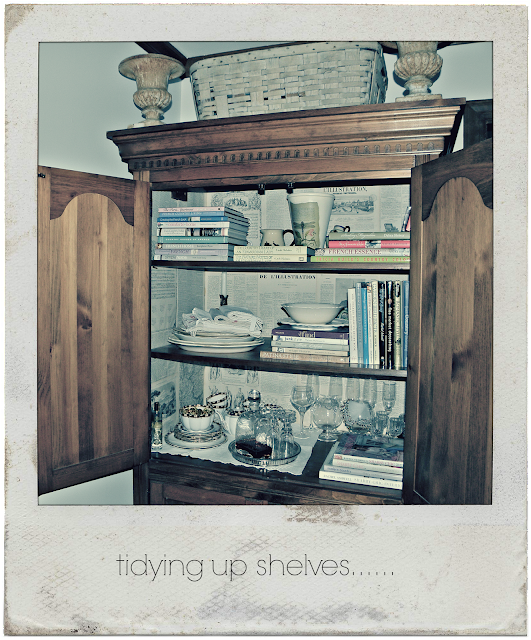 I did a little dusting and rearranging in the armoire - which is still expecting a long planned paint job. My Annie Sloan chalk paint is waiting, all I need are a couple of free days to drag that baby out from the wall and wield a paintbrush. So, nothing new added here, just rearranged my collection of decorating books.......and I did get rid of the dried hydrangeas in the basket on top as they were disintegrating. I should have plenty of this season's blooms to dry later in the year and can fill the basket again. Next week I'll be taking a little trip westward with my honey - and celebrating his birthday along the way......more on that coming up. 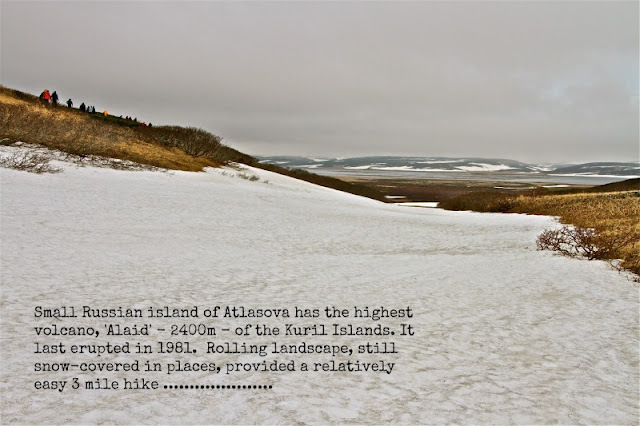 magnificent view of Atlasova Island. This cool (39F), cloudy morning I decided to join the stalwart Brits - to show them I was still an able walker despite years of being a car-reliant, naturalized American, haha! I chose the scheduled 'medium walk' over the 'long hike' , the latter with no stops for photos and supposedly a long distance. 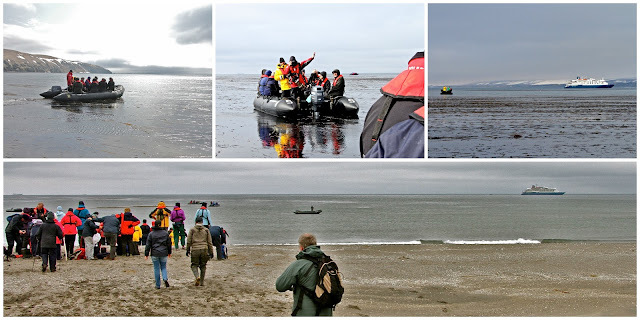 This was a general interest walk to view the human and natural history.......but actually ended up being longer than the hike as we lost the trail and clambered over some pretty steep terrain, and all in Wellington boots as it was also a wet landing to get ashore! ..........stunning shades of green and purplish heather peeking through the gold and brown of the lingering Winter landscape. with their youngsters along for the 'tummy ride'. All in all an exhilarating morning.....definitely worked up an appetite for that waiting lunch. I never eat breakfast when a lengthy morning ashore without 'facilities' beckons! fascinating - read more HERE. 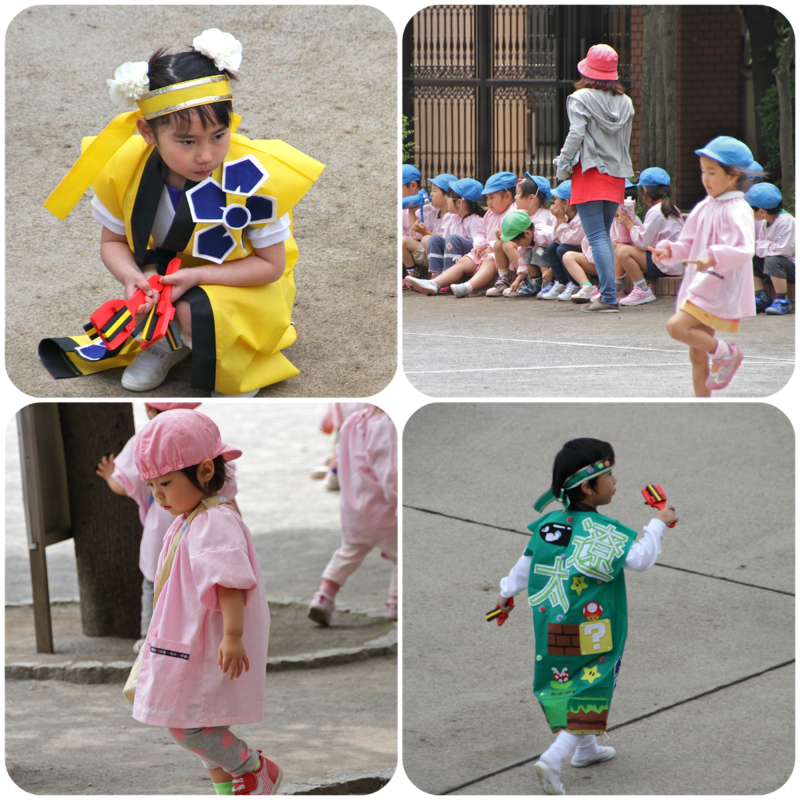 Childcare in Tokyo seems well organized and all the children certainly get to wear great hats! and sang for us at the dockside in Hokkaido. were mandatory - I loved them. Teens starting to show their fashion sense. Ladies queueing up for sweet treats. A female rickshaw driver in a tourist area. Young girls assisting at the Meiji Jingu Shrine, Tokyo. From the bus, a glimpse of a well-dressed lady working in her small vegetable garden. of a small shop we stopped at for tea in Aomori. I'd love to spend more time in Japan! 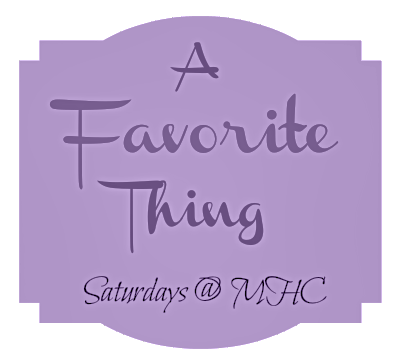 Linking this post to Claudia at Mockingbird Hill Cottage for her A Favorite Thing Saturday party. ............the children who came to play here could have seen the amazing places I visited in the the past few weeks! I hope someday they will have that same opportunity to travel the world and visit with people whose lives are so different, so far removed from anything they encounter in their daily privileged lives, so far away from the mainstream, and yet so rich in the natural order of things. On Wednesday afternoons I've been taking my granddaughter to her voice lesson. The subdivision is a huge, quite pleasant, golfing community full of families with children. Many come to the playgrounds and swimming pools scattered throughout their comfy neighborhood. This Wednesday the sky was heavy with clouds but the air was pleasant. 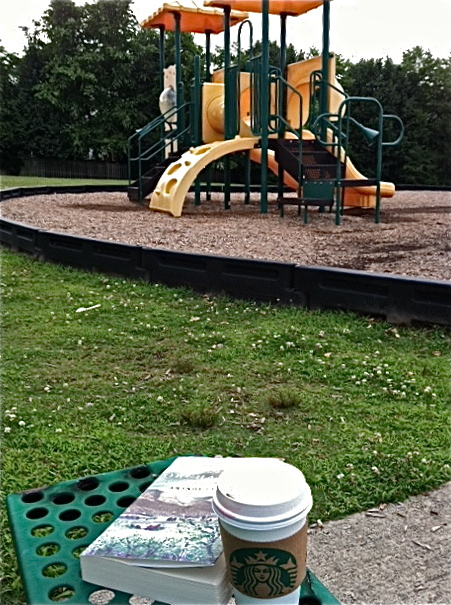 I grabbed a coffee and my book and sat here (iPhone pic) on a bench for an hour, reading in peace and quiet until the children arrived, noisy but having fun swinging and climbing as children do. 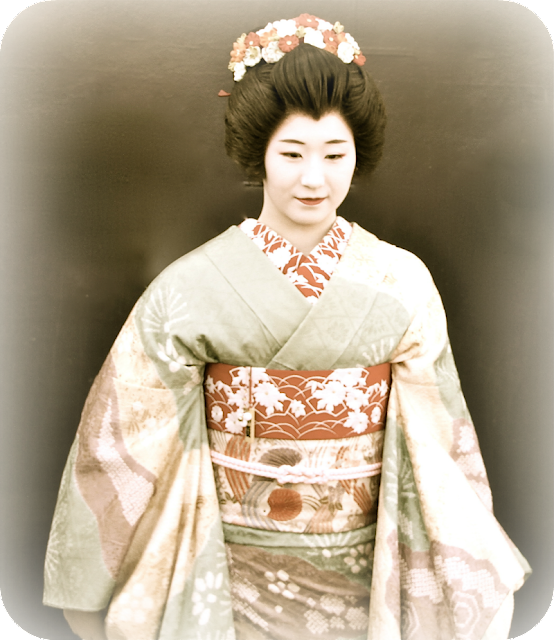 I wanted to tell the children about my travels and how other children live. I wanted to instill in them the need to work hard at school, get all the education offered them, go out into the grownup world eager to earn, but save money to enable travel to amazing places. Travel is not cheap and should be done when young if possible. It will change lives, both for the traveler and the people they meet along the way. 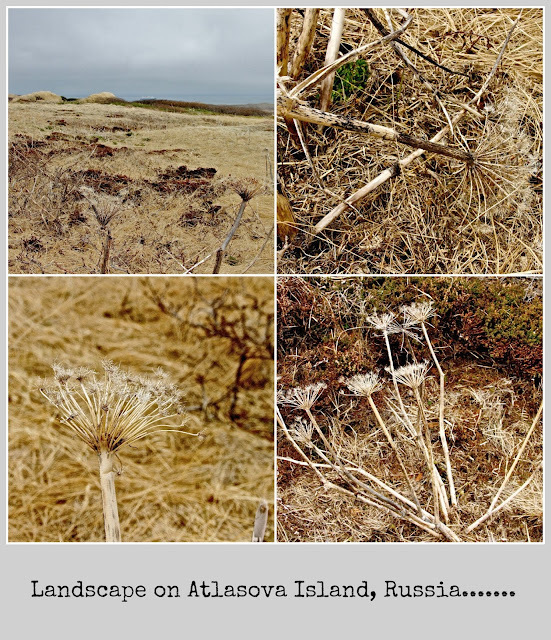 Watching and listening, my thoughts returned to my travels and the children I met in Russia. These young boys and their lifestyle are especially memorable. I'll be sharing more of their story on this remote island in another post later. Bering Island receives just two cruise ships each year, ours (above) being one of them, and is blessed with just five, yes 5, days of sunshine annually.............someone was definitely looking out for us the day we visited, it was perfect. This afternoon was my unexpected, somewhat frightening, Zodiac experience. 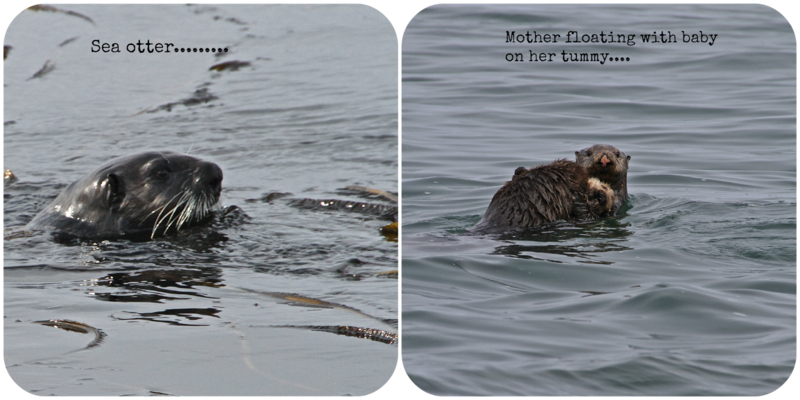 It's funny when I look back at the pics Paula was able to take. Later, when I receive a copy of the expedition DVD and can actually watch the video a crew member shot of the afternoon wild ride..........I'll be laughing even more. thousands of seabirds nesting and flying overhead. surrounded by three overlapping stratovolcanoes. with Baileys - if you wanted, and who wouldn't! and became its first producer. .....Paula and others managed to exit the Zodiac, Sheila, a delightful, adventuresome 80 year old lady from England, and I were still waiting when a huge wave hit us just as I was being helped out. One rope gave way, the boat was tossed sideways and fortunately I fell flat on my stomach into the bottom rather than over the edge into the sea! Completely saturated, I was concerned more for what was happening to Sheila - she was hanging on to the ropes for dear life but was a real trouper and fine! The guys had to cut us free from the ship, and driver Jamie managed to get us away from the waves churning about the loading deck. Somehow, one of the two crew on the deck fell into the Zodiac with us during all the commotion, so we ended up four slightly stunned passengers. Luckily I didn't have my big SLR camera with me that afternoon, just my point and shoot in my pocket - it was wet like everything I was wearing, but still worked thankfully. ................and how did we eventually get on board again? The ship hoisted the anchor and had to sail away without us.......eventually repositioning in calmer waters! 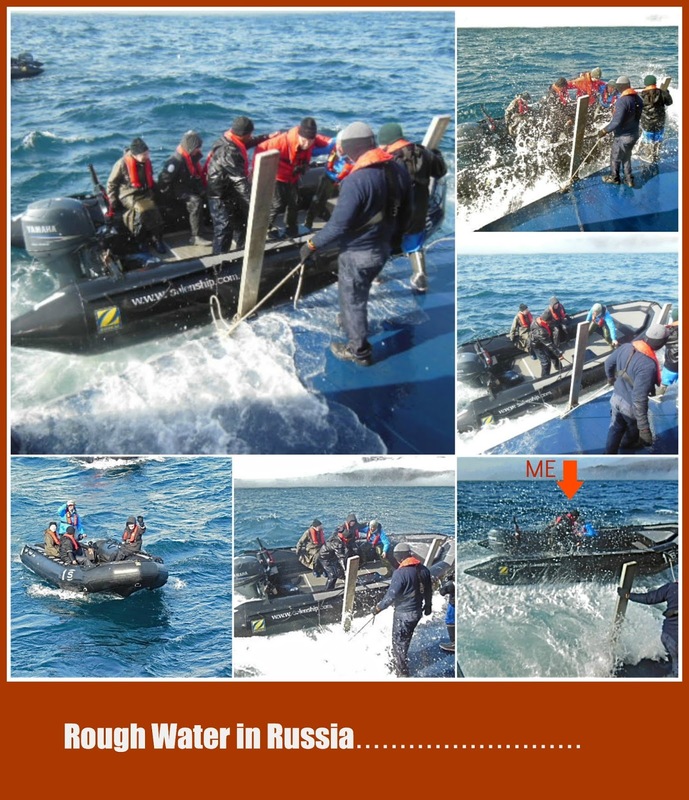 ...and here I am (Sheila too) being assisted back on board, wet through but grateful all ended up well. was the talk of the evening recap that day! Chirpoy Islands, Russia...........Orcas at last!